Joint fractures or broken joints can range from simple fractures that only lightly affect your use of the joint to serious injuries that require surgery and cause a temporary loss of mobility. No matter how severe your joint fracture is, you should see a joint specialist as quickly as possible to help your injury heal properly. Orthopaedic Associates of St. Augustine has one of the most comprehensive joint centers in St. Augustine. We’re proud to have a team of specialty surgeons ready to get patients back to doing what they love pain free. Joint fractures can be caused by a number of things such as rolling your ankle, falling on your shoulder, and more. A physician will take great care to ensure a proper diagnosis is made. The doctor will visually examine the damaged joint. Even if it’s clear that the joint is broken, tests will be performed to assess the severity of the fracture, such as an x-ray or MRI. 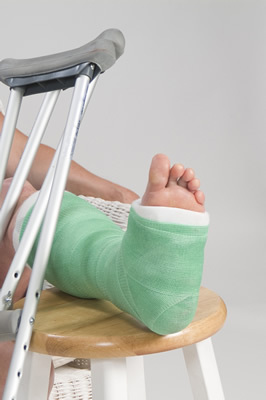 A doctor may fit you with a brace or cast if the joint is stable enough. Depending on the situation, you may be able to use or put weight on the joint immediately. In other cases, it could take about 6 weeks before use of the joint can resume. If the fracture is out of place or the joint is unstable, surgery may be required. The joint surgeon would remove any bone fragments, move the bone or bones back into the correct position, and add metal screws and plates as needed. To learn more about joint fractures, please request an appointment online or give Orthopaedic Associates of St. Augustine a call at 904-825-0540.